We love Carillon Beach! Owners and guests enjoy over 3000 feet of gulf frontage;three community pools. Downtown Carillon offers a fitness center,Yoga Studio, Paddle Board rental and a General Store with bike rentals and 2 restaurants. Carillon Beach has 8 beach walkovers, playground, tennis courts, a basket ball court, a tree lined promenade, and a Meeting House. There is a lot to discover in this beautiful Gulf Front Gated community. 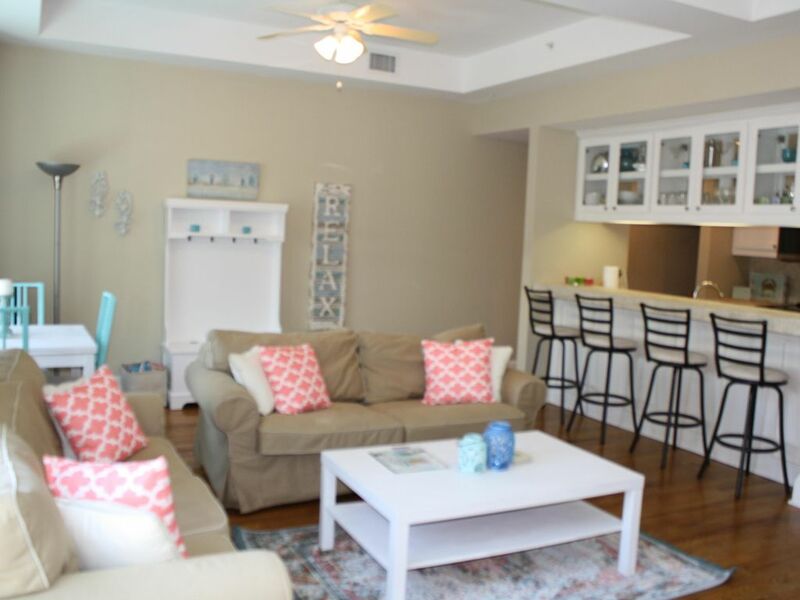 Carillon Beach Market Condo- 2 bedroom & 2 full bath Welcome to your home away from home! We really enjoyed the condo. It was very neat and clean and well organized. We loved the colors. We loved the Carillion complex. The beach access was very nice and handy, but not so close that our young kids could wander down there. The pools were amazing . We especially liked the salt water pool because it did not bother our eyes and was heated. The grounds were lovely and peaceful. We liked sitting at the pavilion by the ocean, eating lunch, and watching the waves hitting the beach while the sea breezes rustled our hair. This was a great place to watch sunsets. We were also at the Pavilion when the Blue Angels roared overhead. We also liked the charcoal grill. We had a great time and loved everything about it. Very nice & clean condo. Beautiful Beaches, pools & homes in the community. Condo was a little difficult to locate & It would have been nice to have had some info in the condo regarding access to the community. (You can not drive over, you can only walk or golf cart over) *The golf cart access was hard to locate too. The "downtown Carillon" was very sparse, not many helpful or smiling faces either. The nice pavered streets say NO parking, yet there were many cars park on it. Sadly, We were not impressed with our dinner at The Lake house Restaurant either. The Beach Cafe & Ice cream shop "decided" to open all week which was nice. (Even though they sell the same prepackaged dippin dots ice cream for $4, that you can buy at Walmart for $1....The hand dipped was better. So, We went out and rode go karts one evening & Dave n Busters another. Overall we had a very nice time & made some great family memories. This 2 floor condo was fabulous, clean, well stocked, great air conditioning, fans in every room. Incredibly comfortable beds. I slept so good in the master bed, And the bathrooms were a nice size. All new appliances. There is a washer/dryer. Plenty of space for 6 people. (8 if you use sofa bed). We loved this condo. Nice location, on the market-with a nearby Lake House restaurant with amazing burgers and a cute little beach cafe that served breakfast, lunch, ice cream and snacks. There's also evening entertainment on the greenspace near these restaurants, with a message board that lists the events. Only miss with this rental: No apparent WiFi in the condo. Luckily, my husband has a hotspot. When you get to Carillon Beach, parking is to the right. The condo is in the same building as Shipwrecked general store, but condo entrance is on the back, close to parking lot. There is an elevator tucked away near parking lot, just look for the bike rack, its near that, this takes you to 3rd floor and door to condo. I offer this info, because we were a little lost when we first got there. Fastest way to beach is to go counter clockwise around lake and enter at pavillon 5, The Pool House. Beach chairs are not included in the condo rental, but there's plenty of seating at the Pool House which overlooks the beach. We rented bikes and trikes (at Shipwrecked) to ride to the Pool House/Beach access. One could walk, but if you're carting a bunch of stuff, that could take a while. I'd advise either renting bikes or bring a wagon to cart your stuff to the beach. There is no way to drive to the Carillon beach access points from this condo. You could also rent a golf cart. Or if you need to drive to a beach access point, there are plenty of spots along front beach rd in laguna beach. Carillon beach was beautiful, never crowded. We liked to leave our stuff in the shade of the Pool House, dip in the ocean, shower off at the pool house, take a dip in the pool, then go back to the condo. BeachyCations rental folks were very responsive to phone call questions. It would be great if a map of the property were available prior to arrival or at the condo when you get there to help figure out how to get around. We would definitely stay here again!!! Thank you Sarah for the lovely review. We are so glad that you enjoyed your stay with us in Carillon. Also, thank you for the helpful hints regarding the property parking and pool access. We will speak to the owner about providing Wifi and see if we can get a map of the resort for future stays. We are happy to help whenever we can and we look forward to assisting you with your future reservations to the area. Thank you for choosing us for your vacation. I greatly apologize that you experienced problems with your TV during your stay. We would have loved to send maintenance back out if we had known the problem still persisted. We will definitely address the issue for future guest. The Carillon Resort does have 4 pools located in the resort,only one of them is allocated for "The Inn" guest only, so there are 3 other pools to use. We apologize if this information was not clearly expressed to you. We truly hope you enjoyed your stay enough, that we could assist you in the future.